The original version of this article, by Jonathan Rozen, appeared with the Institute for Security Studies and Climate Diplomacy. Eddah Senetoi lives with her son in the small pastoralist community of Elangata Waus. They keep cows, goats, sheep, and donkeys to buy food and pay school fees. For her and other pastoralists living in southern Kenya’s Kajiado County, climate change is compounding challenges from land subdivision and privatization, and magnifying social tensions and community conflicts over access to resources. As the world leaves the COP-22 global climate talks in Morocco with “irreversible momentum” for action, Kajiado County offers lessons for preventing conflict and sustaining peace amid worsening climate conditions. Rising global temperatures have caused increasingly variable rainfall patterns in many areas of sub-Saharan Africa, placing strain on weather dependent livelihoods like pastoralism. “Climate has affect[ed] my family and the community at large when there are no rains and the drought… Animals which are the source of income become skinny and later die due to lack of pastures and water,” Senetoi told ISS Today. In Kajiado County, unpredictable climate patterns act as a “threat multiplier” to existing economic and social challenges that stem from the privatization of community lands. Land subdivision in Kenya began as a colonial proposition by the British in the 1950s to limiting land degradation. Privatization policies were continued following Kenya’s independence in 1963, intending to incentivize better land management. However, research by Esther Mwangi finds that individualization of land rights does not precipitate ecological sustainability in arid and semi-arid areas, like Kajiado. Before land subdivision, pastoralists could respond to seasonal variation and drought by moving freely across the land to find adequate grazing for their animals. But now private land titles have carved once common and increasingly scarce resources into pieces for individual use. In response, traditional social networks have helped Kajiado residents’ maintain access to resources and sustain pastoral livelihoods. In many cases, long-standing clan, age group, and family networks have been used to maintain access to land and resources during hard times. While increased scarcity has brought conflict and division, it has also affirmed certain community bonds as people come together to support each other’s animals. Together, people are building climate resilience. In their Collective Action on Property Rights working paper, Shauna BurnSilver and Mwangi highlight these networks and recommend land “re-aggregation” to grant herders access to resources and reverse ecological decline associated with subdivision. In Kajiado County’s Torosei area, for example, youth have organized to prevent further subdivision and deter land speculators. 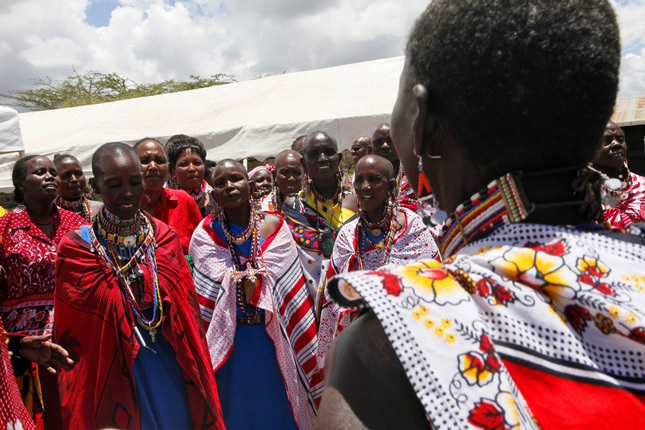 Non-government organizations such as the Mainyoito Pastoralist Integrated Development Organization also work to reduce land sales, strengthen people’s legal representation, and promote the court system for peaceful resolution of land disputes. Recognizing public concern and despite political opposition, the Kajiado governor placed a freeze on land sales in 2014. While the situation is not as violent as pastoral conflict in northwest Kenya, Bobadoye Ayodotun Oluwafemi, former researcher at the University of Nairobi’s Institute for Climate Change and Adaptation, told ISS Today he is concerned about a possible escalation of violence over resources in Kajiado County. World Bank projections indicate that rising global temperatures may result in increased but unpredictable rainfall across East Africa. As Bobadoye and colleagues highlight in the Academic Journal of Interdisciplinary Studies, there are differences between pastoralist perceptions of climate change and meteorological rainfall data. He found that while rainfall in Kajiado County has not decreased since 1970, 83 percent of surveyed pastoralists believe it has. For Kajiado’s pastoralists, shortened and more variable rainfall periods, as well as land subdivision, have heightened perceptions of declining precipitation. This is not to say that pastoralists are unaware of climate patterns. In fact, Bobadoye notes there is significant and accurate indigenous climate tracking that should be integrated into broader adaptation strategies. Failure to integrate local knowledge of climate change risks erodes communities’ trust in larger national or international adaptation plans and jeopardizes peacebuilding opportunities. Efforts to harness momentum for climate action from COP-22 should include reflecting on systemic issues like land privatization in Kajiado, which predate current climate realities but also contribute to climate vulnerability and conflict. Jonathan Rozen is a research associate in the Peace Operations and Peacebuilding Division of the Institute for Security Studies in Pretoria. Sources: Academic Journal of Interdisciplinary Studies, Adelphi, Collective Action and Property Rights, ECC Platform, Esther Mwangi (2007), The Star, United Nations Framework Convention on Climate Change, World Bank. Photo Credit: Maasai women in Kajiado County, Kenya, 2010, courtesy of Georgina Goodwin/World Bank.